Currently being campaigned by Cody Webb in the AMA NATC MotoTrials USA National Trials Championship, the brand-new Cota 300RR is a unique, competition-focused motorcycle designed for serious trials riders. Compared to the Cota 4RT260, the Cota 300RR’s redesigned 288cc engine has a longer stroke and larger bore, resulting in increased power and torque across the range, with a programmable ECU that allows fine-tuning for varying weather and terrain conditions. Lightweight components like a titanium header pipe and aluminum fork helped the bike lose more than four pounds. A front brake with a four-piston monoblock caliper is standard, as are wheels with aluminum D.I.D rims and black-anodized aluminum hubs. The Cota 4RT260 and 300RR are both limited-edition models available via a special ordering process, with the 300RR selling for $9,999. 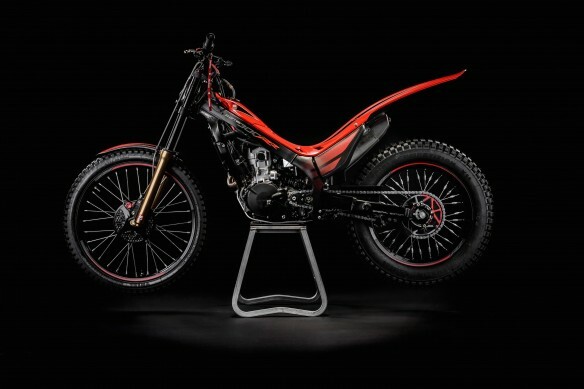 Orders for the Montesa Cota 300RR may be placed beginning July 1. Orders for the Cota 4RT260 are already open. Customers can request a quote online by clicking “Get Yours Now” at powersports.honda.com/trials.aspx. Cota 4RT260s will ship in two rounds: October 2015 and December 2015. The Cota 300RR will ship December 2015.